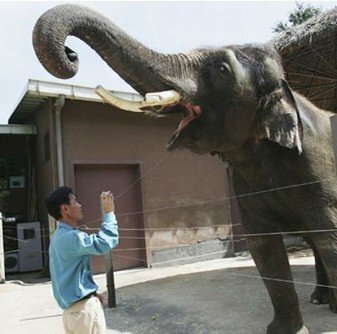 Asian elephant Koshik has astounded scientists with his Korean language skills. Researchers report that the mammal has learnt to imitate human speech and can say five words in Korean: “hello”, “no”, “sit down”, “lie down” and “good”. The zoo animal places the tip of his trunk into his mouth to transform his natural low rumble into a convincing impression of a human voice. The study is published in the journal Current Biology. Koshik’s vocal abilities mean that elephants now join a growing list of animals that are able to mimic man, from parrots and mynah birds to more unusual animals such as sea lions or the recently reported case of a human-sounding beluga whale. The study’s lead author Dr. Angela Stoeger, from the University of Vienna in Austria, said she first came across Koshik after videos of the elephant, who belongs to Everland Zoo in South Korea, were posted on YouTube. After making contact with the zoo, she went to South Korea to record the animal so she could study its unusual vocal talent. Dr. Angela Stoeger said: “We asked native Korean speakers, who had never experienced the elephant before, to write down what they understood when we played back recordings from Koshik. Dr. Angela Stoeger and her colleagues found that Koshik’s calls correlated to five Korean words: “annyeong” (hello); “anja” (sit down); “aniya” (no); “nuwo” (lie down) and “choah” (good). “Human speech has two important aspects, one is pitch (how high or low a sound is) and one is timbre (the musical quality of a voice), and Koshik is matching both of these aspects,” said Dr. Angela Stoeger. Usually, elephants produce much deeper sounds, sometimes of such a low frequency that they are outside the range of human hearing, and these calls can boom many miles away. While Koshik was capable of producing these more typical elephant noises, he needed the help of his trunk to morph these into something far more human. The researchers said this was behavior they had not seen before. “He always puts his trunk tip into his mouth and then modulates the oral chamber,” explained Dr. Angela Stoeger. But while Koshik sounds convincing, the researchers do not believe that he has any comprehension of the words that he is saying. Instead, they think that the elephant took up talking as a way to bond with his human companions. Between the ages of five and 12, Koshik was the only elephant at Everland Zoo, and the researchers said that this was a crucial period for elephant development. Professor Klaus Zuberbuehler from the school of psychology and neuroscience at the University of St Andrews said that the findings were “enlightening”. Scientists say that understanding how and why some animals make sounds could help us to understand how speech evolved. A limited but diverse number of species are capable of hearing a sound, copying it and then reproducing it. Understanding these vocal imitations could help to provide clues about the building blocks of language. Prof. Klaus Zuberbuehler added: “Vocal imitation… may be driven largely by specific social forces, such as the desire to bond with a specific other individual.